Former South Dakota head coach knows a rebuild is necessary in Logan. And he has a blueprint. 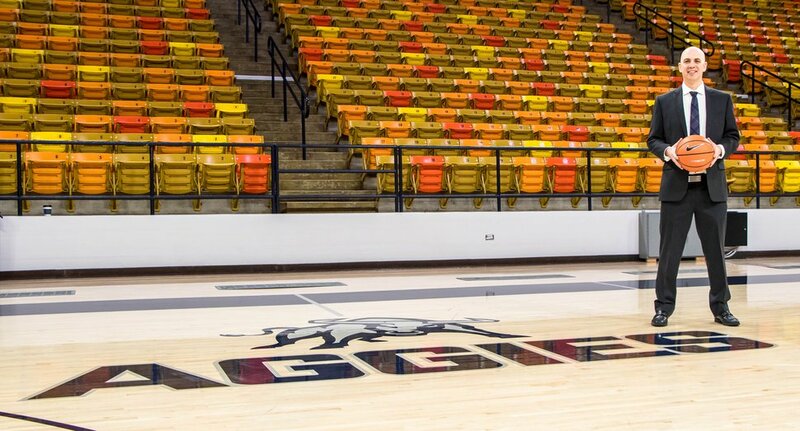 Photo courtesy USU athletics: New Utah State men's basketball coach Craig Smith poses on the court inside the Dee Glen Smith Spectrum in Logan. Smith was hired in March. Logan • He knew absolutely nothing about Utah State. At first, it was just another scout on tape he had to cut through, another team he had to decipher how and where they had success against an upcoming opponent. Back then, Craig Smith was an assistant coach at Colorado State, and back then, USU had plenty of similar opponents to the Rams in non-conference play. But once he hit play, he couldn’t help but notice the electricity. You know, that thundering noise, that massive wall of rowdy students synonymous with the Dee Glen Smith Spectrum. Every game he broke down, he heard it. It was impossible to miss. Even then it seemed like one of the most difficult places in the country to play, just through the TV. This isn’t lip service, either, he says. He recalls watching those games more intently, more enthralled, more engaged, thinking even back then the Rams were lucky to avoid a place like that on the non-conference slate. Now, all these years later, he’s in a corner office in the Wayne Estes Center, just across the parking lot from The Spectrum, a pristine view of Cache Valley in the fall beyond his row of windows in front of his desk. This is home. This is Craig Smith’s program now. He was hired as the USU head coach in March. Now it’s his turn to experience the raucous environment first-hand. First things first, though. First comes the build. The Aggies aren’t where they were a decade ago, not one of the most dominant programs in the Intermountain West. History and that noted “Spectrum magic” run hand-in-hand in Logan. And it’s been missing for a bit. Smith knows of only one way to bring the noise back. You have to give them a show. Smith points out his windows north toward Maverik Stadium and finds an easy local analogy for how you get fans to fall in love with your team. Win. Score points. Lots of points. Make it look fun. Make it look hard for the opposition. Win the crowd. These aren’t cliches, he vows, they’re actually bullet points in his blueprint. Be the first on the floor. Be the first to an offensive board. Be the first to fly into the stands to save an errant pass. Utah State is the latest project. It took something special to get him out of the Midwest. After spending four years as head coach at South Dakota where the Coyotes went 79-55 and 38-26 in Summit League play, Smith felt this was an offer he just couldn’t refuse. South Dakota’s set up for the long-term, he said, with strong recruiting classes incoming. Now in Logan, he’ll have to get off the ground with just four key returners from last year and nine underclassmen. His recruiting style will be, as he explains, “inside-out,” meaning USU will vie for the best in-state talents there are who will fit his style of play. 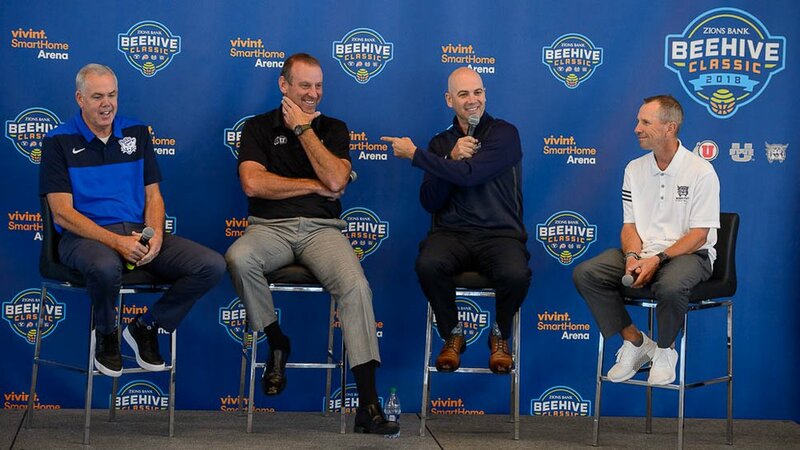 (Trent Nelson | The Salt Lake Tribune) The four college basketball coaches competing in the Beehive Classic speak at a news conference at Vivint Smart Home Arena in Salt Lake City on Tuesday Aug. 21, 2018. Dave Rose (BYU), Larry Krystkowiak (Utah), Craig Smith (Utah State), and Randy Rahe (Weber State). USU assistant coach Austin Hansen joined Smith in Logan after coaching alongside him in South Dakota. So while from the outside-in, it might seem like the hike northward in the talented Mountain West Conference will take some time — and it very well might — the staff has staunch faith in its ability to mold a program to fit Smith’s specific style. Then, there’s one last bullet point. One that is not negotiable. “You better bring toughness,” Smith said. There is a championship belt making the rounds around the USU basketball team each week. A literal title belt. Like, a professional wrestling belt. And whoever wins each week, gets to tote it around campus, to and from practices, and deservingly gloat because on that given week, they won. It’s called the GATA belt. It’s a mantra Smith picked up while coaching under longtime college basketball mind Tim Miles. This is how you establish that you’re tougher than the opponent. Every day hustle plays are charted in practice. Tips, deflections, charges, dives on the floor, offensive rebounds. They all become stats and at the end of each week, whoever has the highest stats gets the belt. When Smith was at South Dakota, he and his staff were tuned into the much-hyped Floyd Mayweather-Manny Pacquaio fight in 2015. Mayweather walked into the ring with a belt and that’s how the GATA belt came to be. Since arriving in Logan, they huddled with USU administrators and chose between three different heavyweight belts and eventually ordered their customized GATA belt online. “It’s a way of life,” Smith said. It’s also how he hopes to expedite the growing process on this young, inexperienced team that has the odds stacked against it in 2018-19. It’s been going on eight seasons since the Aggies made the NCAA Tournament. That’s when they were a postseason mainstay whether in the Big Dance or in the NIT. From 1998 to 2011, Utah State made nine NCAA Tournament appearances and four appearances in the NIT. The last postseason tournament USU was in was the CBI in 2012. Morrill repeated this: “You’ve got to be who you are.” Smith predictably asked a ton of questions, because that’s what you do when you get a chance to break bread with the legendary figure who once held your job. Those close to Smith say that’s ironically been his mantra all along. 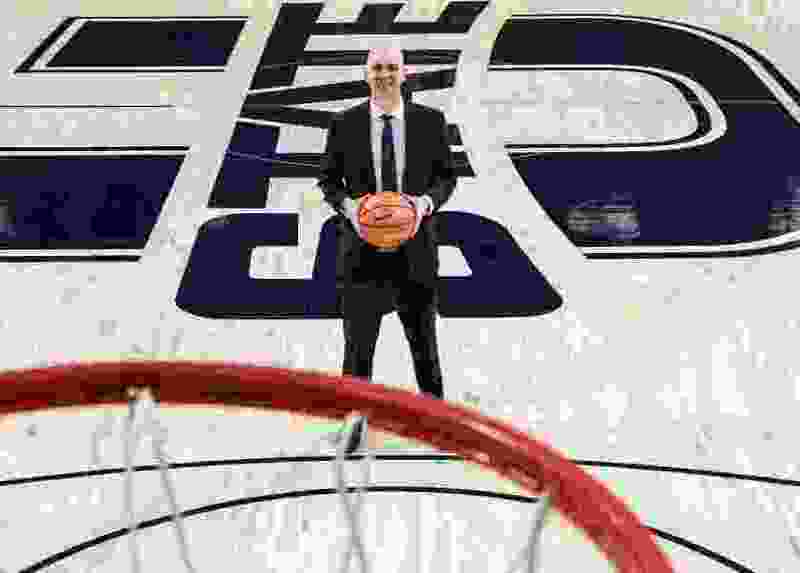 And it’s led him to that corner office in Logan, where he’s now just a few footsteps away from the Spectrum where a decade ago, he was captivated by what USU basketball was, and is still captivated by what it could be once again.